Keinsington Pride is also known as the Bowen mango in Australia. Bowen is the name of the place where the mango was first grown after the seedling was brought in from India by an unknown source and Kensington is the name of the plantation where it was likely first grown. It seems to be a hybrid between Indian and South Asian varieties. 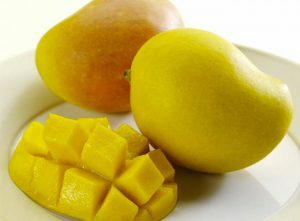 It is the most popular mango in Australia and commands about 80% of the market in Australia- it is also one of the oldest varieties. This mango has deep orange, soft, juicy, fibreless flesh under yellow skin. Its unique aroma has fresh citrus notes with flavors of peach, bananas and sweet grapefruit. Kensington Pride is the most popular variety grown in Australia, and accounts for 80 percent of all the trees planted. It is grown in the tropical and sub-tropical regions of Australia. Peak availability is from September to February. Early flowering happens in the Northern regions and availability shifts South as the season progresses.